Barbie in Princess Power is the latest guise of Barbie and one that has been hugely successful with my daughter. 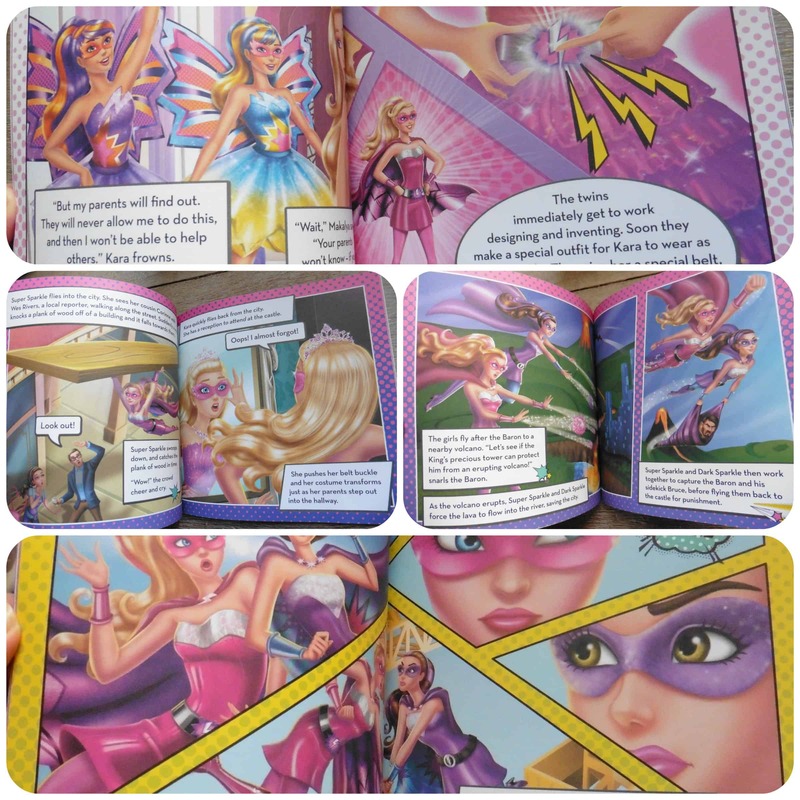 Princess Kara acquires a magical power after being kissed by a butterfly that gives her the power to turn into a superhero allowing her to prevent disasters and save the day! 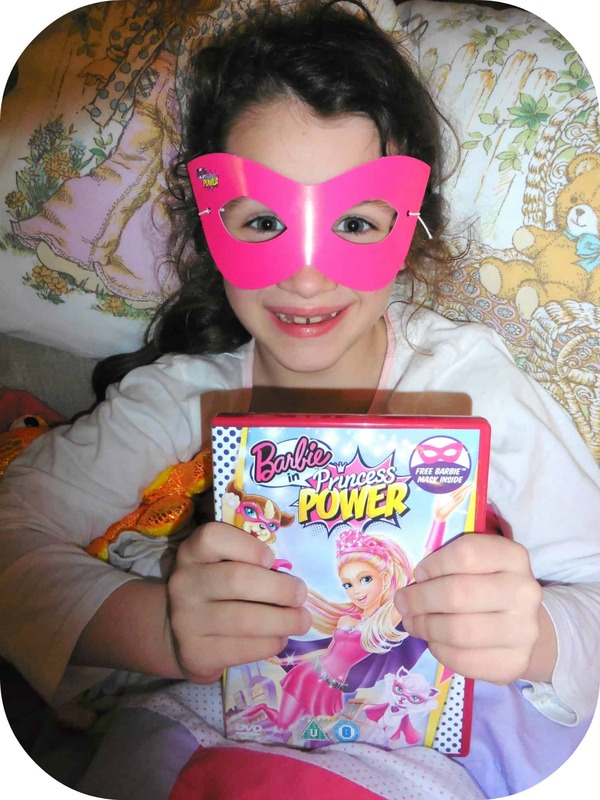 The Barbie in Princess Power Jigsaw and Book set from Autumn Publishing is perfect for young Barbie fans to read about the adventures of Princess Kara using her superhero powers to save the town. The book is written in comic book style, with full colour pages and lots of illustrations to help guide you through the story. Miss M who is 7 and and able reader, enjoying reading this herself especially at bedtime. 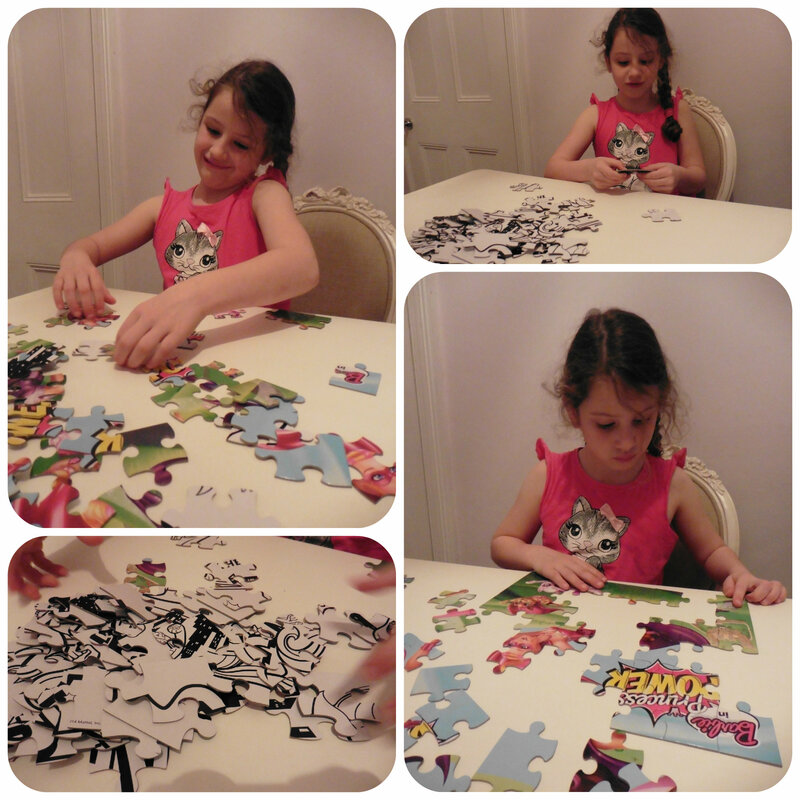 A 60 piece jigsaw is included in the set which is an exceptionally high quality puzzle, the best I have ever seen. The pieces are incredibly glossy and strong and Miss M couldn’t wait to get started. The jigsaw is a brightly coloured image of Barbies Kara and Corinne in their superhero costumes flying through the sky. Miss M thoroughly enjoyed completing this and did it herself. On the back is a equally glossy black and white picture which is designed to be coloured in and wiped clean so you can keep redoing it in any colours of your choice. Miss M just enjoyed the challenge of doing the puzzle of the picture on the back. 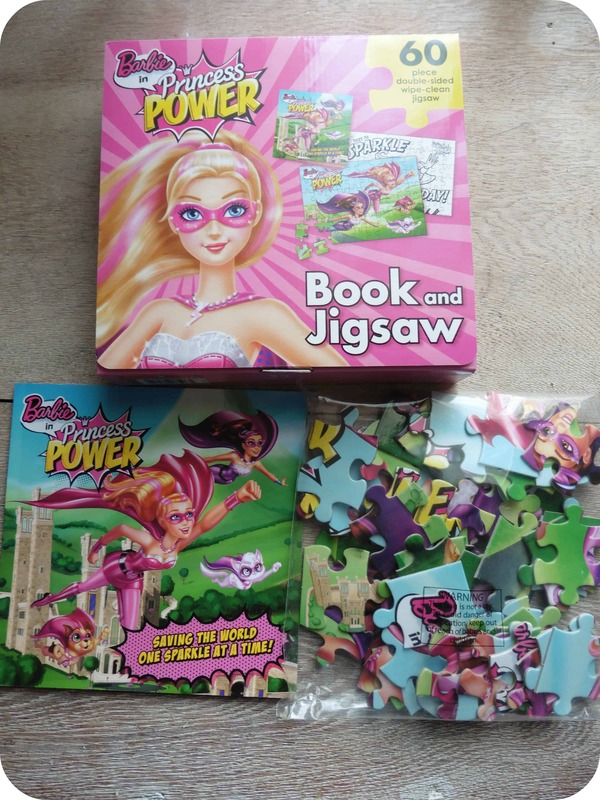 We loved this Barbie in Princess Power Jigsaw and Book set and are pleased to offer our readers the chance to win 1 of 3 copies in a giveaway! All reviews are my own opinions and I received a Barbie box set in order to write the review. Barbie™ In Princess Power dvd stars princess Kara™, a modern princess living a relatively normal everyday life, until one day she is kissed by a magical butterfly that gives her super powers. 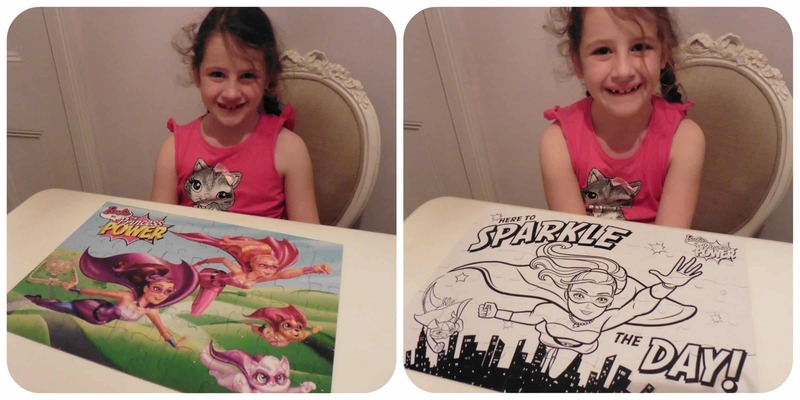 When she senses trouble around she is able to turn herself into Super Sparkle, a super hero who can save the day! Miss M who is 7, couldn’t wait to watch this film. She was excited to see Barbie™ turned into a superhero, something a bit different for Barbie™ films. The DVD comes with a pink superhero mask to wear and we settled down early on a Saturday evening to watch this. With a running time of 71 minutes it’s the perfect length for young ones but enough time to tell a good story. Super Sparkle acts as a superhero to save numerous disasters happening around town, rescuing people from danger and chasing after baddies. It then turns out that the Baron of the castle where she lives is trying take over and it takes the power of both her and her cousin Corinne (who has the power to become Dark Sparkle), to finally save the day! Both my children thoroughly enjoyed watching this film and in fact were glued to it throughout, I’d definitely recommend the Princess Power DVD for any Barbie™ fans who love an action packed adventure! 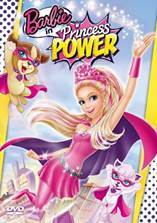 To celebrate the release of the brand new hero adventure Barbie™ In Princess Power, we have a copy to give away on DVD. Barbie™ stars as Kara™, a modern-day princess with an everyday life. One day, after being kissed by a magical butterfly, Kara™ soon discovers she has amazing super powers allowing her to transform into Super Sparkle, her secret alter ego who flies around the kingdom ready to save the day as they discover that there’s no greater power than the power of friendship! You can play out the adventures of Kara with the Super Sparkle Doll which transforms from a princess to a hero! Don’t miss this brand new hero adventure, Barbie™ In Princess Power, available on DVD, and DIGITAL DOWNLOAD from 16th February 2015 and available to pre-order now! What creature is Barbie™ kissed by when she transforms into Super Sparkle? BARBIE™ and associated trademarks and trade dress are owned by Mattel, Inc.